If Don and Nick are just boarding the train in Taipai at 4:57 (train probably leaves at 5:00) and it takes 2.5 hours to reach Jiji town, then it would be nightfall when they do the roadblock since the sun sets at 6:40. And that is probably why they are not seen doing the roadblock, this this would be a dead giveaway that Don and Nick are dead. All this seems to indicate that somewhere Don and Nick fall way behind the other teams, even behind TK and Rachel. Did they get a penalty? Did they get lost again? Did they miss the plane for some reason? Lots of questions and no answers. That is very odd. In the commercial preview, Nick says: "It's On" and then smiles while they're in line at the airport, so that must mean that they have not yet made a mistake/fallen behind yet . And also, in the episode preview, Nick said: "No competitors left in the game, just a bunch of pansies." and we can see he's inside a cab and it's daylight outside (seems like afternoon or noon), so they couldn't of gotten lost before the airport? That must mean they got a bad flight again and fallen behind (since Rachel and TK could not possibly have beaten them to the airport)? Or that they had trouble getting directions to the train station? Dammit... Although... They might not be thattt far behind... It might be close to dusk when Ron and Chris did the roadblock. And how do we know that Rachel is doing the roadblock while it's daytime? Isn't the picture in yellow? Maybe the editors purposely did that in the preview so that we couldn't know what time it was. Or am I missing something again...? Or there is a possibility that CBS is playing tricks, since they can't show everything in the preview? Right? Pitstop! we can find this! They look very happy! Although this isn't conclusive proof that Ron & Christina survive this leg, the photo gives me even more hope that they in fact do! And I guess if that happens -- as I hope -- then I can say to all those who assumed that Ron & Christina are eliminated in Taiwan: "You were saying, guys?" A 24 Hour Pitstop due to flight Facts like with Nicolas and Donald!!! Taichung might be another possibility; the THSR site has virtual tours, and that's the closest platform match I've found. uh oh... So does that mean Nick And Don enter the train at 4:57pm and exit the train in those pictures?If so, it's not looking good for them. 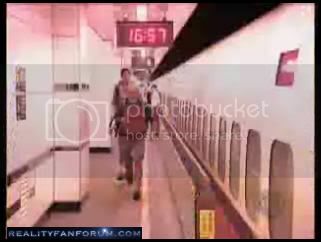 Either that, or CBS is playing tricks with the cameras and it's actually them LEAVING at 4:57pm and that the clip from the previews is the same as the these pictures (them exiting the train). That, or CBS maybe just put that clip in there and it isn't even part of the episode. you are right Oliver there is still substancial hope for them but I still find it to be rather slim so does anyone know what happened to the whole Ron and Christina ELIMINATION thing I thought that was something we thought from the start?? Hey, Kiwi Jay. What is your proof? Since it makes no sense given the pitstop start times in the 7pm to 11pm range and the need of the first 3 teams(TK&Rachel not part of this party) to be in Taipei as close to noon as possible, I think you are DEAD WRONG. Anything can happen in the next episode. We don't know who's going to be eliminated and can only guess with the clues we have. So we can't really say Nick and Don are quite hopeless next leg. We don't know for sure if our clues are solid (unless I'm missing something again... ). Kiwi Jay - it was thought that Ron and Chris were eliminated at F4 because we knew based on a spoiler that the other three teams made it to Taiwan -- but now that we also know that Ron and Chris make it to Taiwan it's anybodies game. Sorry if I am being dense, but can someone point me to the evidence that the pic of Don and Nic at the train station at 16:57 is them getting ON the train rather than OFF, or is it just an assumption that is being made at this point due to the fact that there is a scheduled train that leaves the station at 17:00? About this: The Umeda Sky tower in Osaka has a glass elevator which offers the following view about halfway down (cap from video here). Just throwing out possibilities. I like Slowhatch, this could be how Rachel & TK catch up, and I think they do as well as make the flight to Taipei with the other teams. 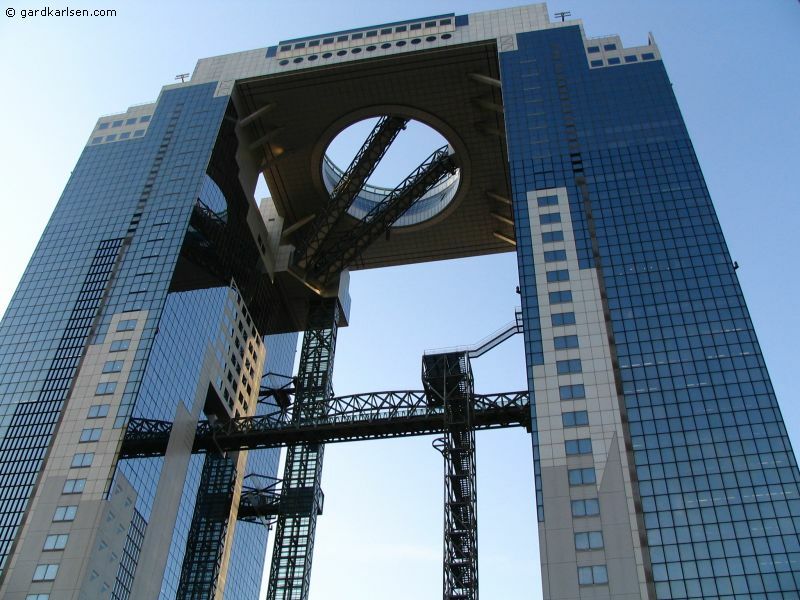 as far as I can tell these are the hours of operation : The Umeda Sky Building is open from 10:00 am to 10:30 pm(admission until 10:00pm) . It looks like they are clearly getting off the train...according to the times we have it would not make sense that they would be getting back to Taipei at 4:57 as it's already been concluded that the teams arrive around noonish/early afternoon....not enough time to do the jeep thing. they however could be arriving at the place where the jeep RB takes place....that makes sense. If the first two teams arrived osaka around 6-8 PM...typical pit stop releases them at 6-8AM? They get to the tower....have to wait till it opens at 10...head to airport. Get a flight which gets there mid afternoon? Then somehow Tk/R catch a different flight to Taipei. It is clear that R/C N/J arrive at the airport around the same time, but TK/R arrive with the other teams..thus the immigration line in the commercial. I believe this is where someone says the quote "Sorry, Guys, I'm Not Happy to See You" as they have caught up. Another theory is that all the teams went straight to the airport...had to get a connection through another city because it was still too early for the direct flights. The 3 hours allowed Tk/R to get the direct flight. OTher teams Possibly caught a flight to Tokyo then were able to catch the 9-10AM flights to TPE? This theory really depends what time the teams got released from the pitstop in osaka. You never know apskip but I am doubting myself too I think different too!! This is for Mrs. Shrek, I think Oceangreen has said it the best. could either mean that they arrived at the station at 16:57 (~5pm) or departed at that time. If they were departing at that time, I think they could very well be behind the other teams..
From Taichung station to Jiji township, like Jason had mentioned, it takes about 1.5 hours by train (maybe about 1 hour by taxi). Now this means that they would be at the 'jeep testing facility' by at least 6:30pm. Now sunset at central Taiwan is approximately 6:40 PM around the following days. ARRIVED back at Taipei station at 4:57 pm. However, I am suspecting that my initial idea was right since they have not shown any clips (Unless I have missed it!??) with nick&don at the 4WD jeep site, in an attempt to hide that they are somewhat behind by the obvious differences in time. Is it just me or does the chance of an intersection to occur at the Taipei 101 (as strongly suggested by our spoiler) just become less likely the more we look into the previews? As of the location that Nate&Jen had been arguing on (I placedmarked it on my map), whilst also trying to find a taxi, in the previews, DIRECTLY underneath them is a normal train subway station. Were they using the normal train too? I'll throw this in, I know its not a very good picture but it looks like Don in his solid color shirt (eta: Nope its orange & Blue! ), Nic carrying his backpack etc. Note the lights/dots -- maybe we can find this perhaps around Ximending? ETA: Nevermind!! I guess its Taoyuan International afterall? This doesn't look like Taichung train station when compared with the pic posted by slowhatch because Taichung station looks like an open-air one while this one is not, so I still believe this is Taipei station. they can't be taking the train ariving at 1706, so if they were arriving at Taipei in the pic, aren't they too slow to get off the train?? point if there is an intersection on this leg maybe Nicolas and Donald catch up to them? ?